Followers of fantasy writer David Hair will already be aware of his ‘Return of Ravana’ timeslip trilogy, written for a young adult audience. This version of the second book (formerly known as ‘The Ghost Bride’) has been updated and revised for the UK re-release. This review contains spoilers for the first story in the series, The Pyre. Our heroes are the reincarnated souls of characters who have been reliving the same story for hundreds of years. The first book told how the Magician King Ravana sought to achieve godhood in a ghastly ritual which was thwarted by our heroes in the distant past. In an intertwining story, set in the present day, a group of teenagers are thrown together by fate and realise that they are linked by forces beyond their control, and have to fight for their lives as Ravana returns to claim what he believes is his. In the second book, the historical action moves several centuries ahead to the time of the warrior prince Prithviraj Chauhan and his loyal court poet Chand Bardai. As the action starts, Chand is aware of his past life, and of how he must prepare for the challenges ahead. The souls that we first met in ‘The Pyre’ re-appear, drawn together by fate and the machinations of Ravindra. Meanwhile, back in the future, having barely survived his defeat at the hands of our heroes, Ravindra plots his return and his revenge. A young Bollywood actress announces that she will give her hand in marriage to the winner of a new reality TV show, Swayamvara Live, where young men will compete for her favour. Vikram, the reincarnated soul of the poet warrior, steps forward and joins the competition, recognising in the young actress the soul of the woman who has been part of his many lives through the centuries. The stage is now set for a fast paced and enjoyable tale of love, friendship, jealousy and revenge, spanning two time periods. Vikram must draw upon his past life skills and memories, and the strengths of his friends, to battle Ravindra and save them all. As with the first book, I found The Adversaries to be a good, gripping read which kept me engaged and interested. 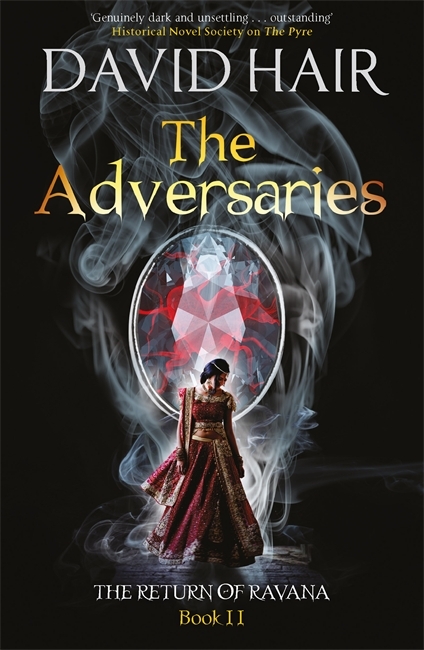 I would definitely recommend that readers acquaint themselves with The Pyre before reading The Adversaries, but readers who liked The Pyre would probably enjoy the sequel. This entry was posted in Review and tagged David Hair, Fantasy, Ravana, Review, Timeslip, YA. Bookmark the permalink.